NuView 180s | MasVidia Inc.
NuView 180s is an ultra-wide 180 car camera with 5 view modes changing. No Blind Spot in front/rear of the car. Camera provides very safety view for drivers to avoid the blind spot. Rear view and front view are both inside a camera and user can easy to change to front (normal image) or rear (mirror image) view by setting. The camera provides rear (mirror image) / front (normal image) view 100 degree single-view / Multi-view (2 windows corner view) / Multi-view (3 windows) / Bird’s view (Top view) / 180 degree panorama view. NuView 180s camera has good low light condition sensitivity, and it also build in a high speed / high performance powerful processor inside camera. It can process the complicated image algorithm for the ultra-wide image and output 480I 30fps multi-window video. NuView 180s car camera provides an ultra-wide 180 degree view angle without “big control processor box”. 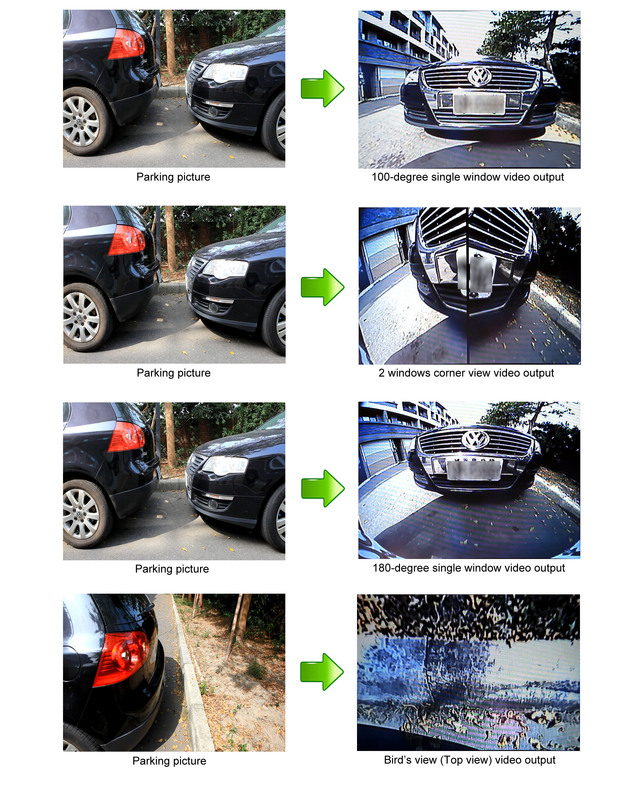 Normally, most of vehicles camera view angle are around 90 to 140 degree. Only a few products have 180 degree view angle, which need a “big control processor box” to provide this kind of wide view angle function. Compare to other 180 degree car camera, we just need a small size camera to have this kind of 180 degree view angle function, it does not need any extra control processor box. This is also related to camera installation. 1. 180-degree view angle rear/front camera with multi-window view angle output. 2. Support different 5 view modes. 4. High integration small size camera without extra control processor box. 6. Easy to change both front and rear view mode.